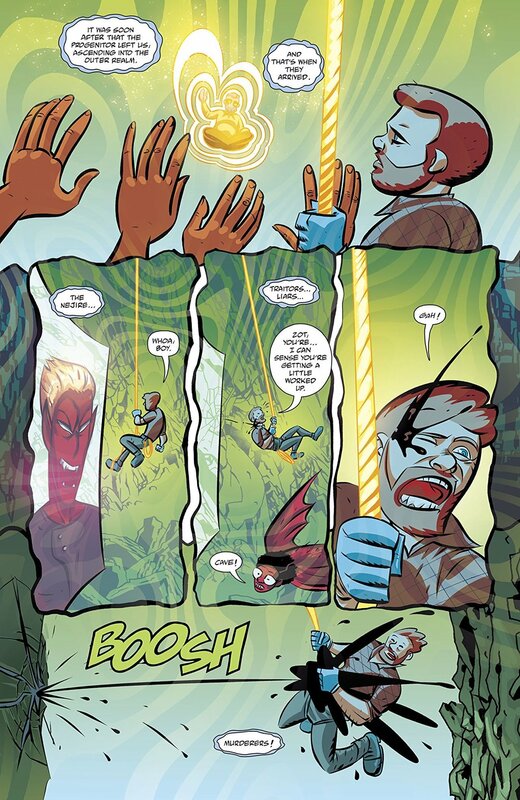 Cave Carson Has An Interstellar Eye #3, by Jon Rivera, Michael Avon Oeming, Paul Mayberry, Nick Filardi, and Clem Robbins, finds Cave, his daughter Chloe, and their friend Bartow trapped between two sides of an alien war. Will they be able to end the war before tragedy strikes? After discovering that parasites may be what’s behind the war between the Lazer Monks and the Nejire, Cave and Bartow use Cave’s cybernetic eye to travel into the mind of Zot, one of the Lazer Monks. While there, they learn of the origin of the Lazer Monks and the legends of their Progenitor. Meanwhile, Chloe helps the other Lazer Monks fight off the Nejire’s assault, capturing them. In Zot’s mind, Cave and Bartow discover one of the parasites and are able to link with it as well, finding out why the two sides are fighting. With this information, Cave and company reconcile the two sides. In the back-up story, Cave comes up with a dangerous way to save the trapped Bully, the Antwerps, and his crew. He gets the Antwerps and the crew away from the explosion and prepares to go back to get Bully. This installment takes a standard sci-fi concept and tweaks it a just little bit. A parasite controlling two sides of a war for its own purpose is old hat, but this issue finds a way to differentiate it from other such tales by melding it with the Lazer Monk’s Progenitor legend, linking it to the origin of the Lazer Monks for something that’s intriguing and elevates a staid concept to something better. That said, at first it’s a little confusing what exactly is going on. Readers don’t find out how Carson and Bartow are discovering what they are until the book is almost done. The first few pages of the book are jarring in this respect, leaving readers questioning what’s going on. Of course, this could be on purpose. CCHAIE has a hallucinatory feel to it and this plays into that, jumping from what happened at the end of the last issue to what’s going here, something that doesn’t even match up with what was happening before. It fits the tone and the reveals later make it all worth it. The Progenitor’s legend is a highlight, but it’s a little predictably unpredictable (if that makes any sense.) Without going into it very much, it’s because of him that the whole war started. The reasoning behind it is interesting and takes something that could have been cliche and spruces it up. The whole Progenitor plot is better than it looked like it was going be on first glance. Sure, it goes to the places it looked it was going, but it does it in an unexpected way. This isn’t the first time a legendary figure has been responsible for something horrible, but the explanation behind it all is what saves it from being formulaic. The back-up story is short and sweet. It whets the reader’s appetite for what comes next, keeping them hooked. The art is still as gorgeous as ever. Oeming’s art is an acid trip on the page and fits the book perfectly. The only problem with it is that it’s sort of an abundance of riches and a bit formulaic in the way it’s presented. There’s always weird stuff happening in the background and panel borders, there will always be some kind of cool distortion of the character’s figures, et cetera. It’s not a drawback, because it all looks so amazing and fits the book’s aesthetic, but it’s becoming a “look” which isn’t always a good thing. Nick Filardi’s colors are sumptuous and really make everything pop. Oeming’s style plays a part in the the trippiness of the whole thing but without Filardi’s colors, it wouldn’t be the same. Together, they are the perfect art team for this book. Cave Carson Has An Interstellar Eye #3 takes what could have a bland, formulaic sci-fi story and tweaks it a bit, taking it into territory that make it a much more worthwhile experience. It’s not perfect by any means, but it’s an improvement on the last issue. The creative team uses the book’s hallucinogenic flavor to enhance the whole affair, but it’s starting to feel a bit formulaic in its use, which could be a problem down the road. However, this is still a trip worth taking.